heaven on earth as your reality! Communicating with your angels is EASY! 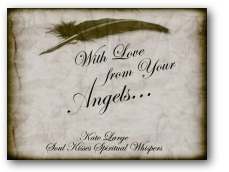 You have a group of angels available, ready and excited to help you in every moment of your existence. Are you working with them?? Whether you've been trying for years, or this is your first time, the guidance in the With Love from your Angels guided Workbook and Journal will help you! Now there is a tool that provides guidance to work with your angels in an experiential way in your own home, at your convenience! "You don't ask for enough help!" 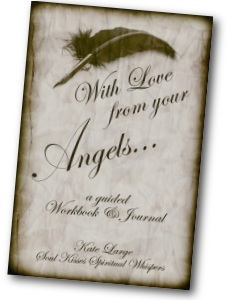 In this guided workbook and journal you will open your heart to connect and receive guidance, messages and healing from your angels! all areas of your life! No topic is too big or to small! I ordered the workbook and journal on Monday and had it by Wednesday. Very pleased with the quick turnaround. When I opened the package I found this beautifully wrapped journal with the meditation CD and a thank you note from you. You do a wonderful job of packaging your items and it makes it seem so much more personal and special. I just love it. I've already starting using the CD and reading through the workbook. I feel like these tools will definitely help me with my spiritual journey. It was nice to know that meditating and connecting with your angels didn't happen overnight as I was thinking I was doing something wrong. Knowing this has encouraged me to continue with meditating and following what my heart desires.